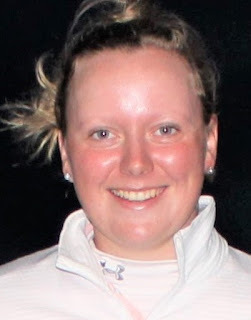 Chloe Goadby (St Regulus Ladies), a student at Stirling University, and Lorna McClymont (SRUC Elmwood) share the 36-hole lead in the R and A Foundation Scholars' women's tournament. Chloe posted the clubhouse target of 141 with rounds of 70 and 71 over the Eden course. The final round will be over the Old Course at St Andrews. Goadby's efforts were highlighted by an eagle 3 at the second hole in her opening 18 holes. In the final group of the day, Milngavie's McClymont joined Goadby, pictured on right, at the summit after a superb four-under-par 69 in the afternoon. “I gave up a few chances out there, but there were some tough pin positions, so I couldn’t get too greedy,” Goadby, 21, said. “I played steadily, just didn’t hole many putts so I felt as though I could have been a few shots better, but I’ll certainly take five under for the day. McClymont, 18, making her debut in the event, added, “It’s great to be sharing the lead, especially as my second round included a double bogey at the 14th. The pair sits one-stroke clear of a trio of players, Aberdeen's Jasmine MacKintosh (Robert Gordon University), Nicola Slater (University of Stirling) and Norway’s Emily Michelle Laws (University of Stirling). Mackintosh had scores of 74 and 68 - her second round being the lowest of the day in the women's tournament. She had five birdies in halves of 35-33. 141 C Goadby (St Regulus Ladies) 70 71, L McClymont (Milngavie) 72 69.